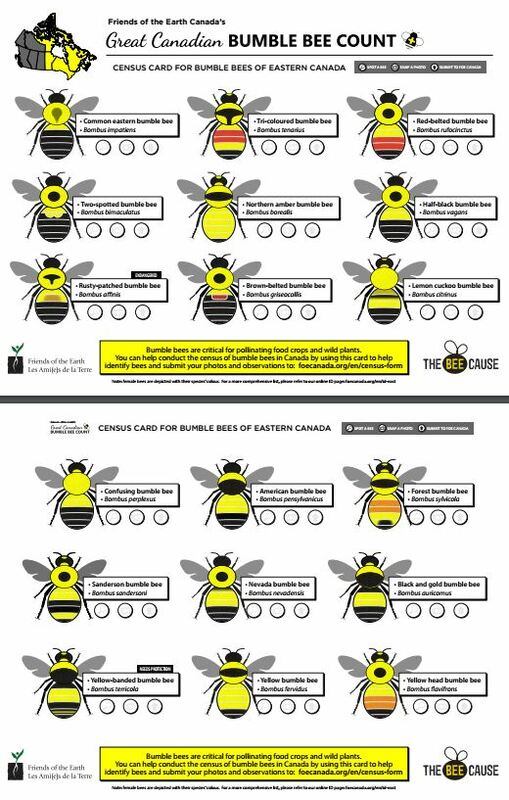 August 3, 2017 (Ottawa, Ontario) - In response to global concerns about declines in pollinator biodiversity, Friends of the Earth is launching its second “Great Canadian Bumble Bee Count” and offering downloadable “Census Cards” to help identify the bees. The campaigns asks people to take pictures of bumble bees and to upload the photos with observations so that scientists can better track the bees and learn more about them. The “Great Canadian Bumble Bee Count” runs until September 15, 2017. Participants in last year’s event submitted 1218 photos and observations for the census including 12 submissions for the critically-at-risk Yellow-banded bumble bee (Bombus terricola). Participants can upload their pictures to the Census Form and can also encourage more people to participate by posting pictures on social media using #BumbleBeeCount. More than two-thirds of the food crops we depend on benefit from pollination by native bees, honey bees and other pollinators. Bumble bees are capable of buzz pollination making them particularly effective pollinators for certain crops and flowers - including blueberries and tomatoes. The Rusty-patched bumble bee, once abundant in southern Ontario is now almost extinct and officially designated as endangered. Six more bees have declined to such an extent that scientists have advised the federal Minister of Environment to take steps to protect them. There are over 850 confirmed species of wild native bees in Canada with little proper monitoring.